Dexton Kids Pedal Car: Cruise Around Town in Style! Are your kids ready to hit the park this summer? Why not make a real entrance with a pedal car that’s sure to turn heads? A Dexton Kids Pedal Car is just the ticket. These realistic looking pedal cars are safe, stylish, and whole lot of fun. Pedal cars are a great way for kids age three and up to develop gross motor skills. They’re a great first step towards more complicated forms of transportation like bicycles. Instead of having to worry about balancing (and the scrapes and bruises that come with learning to ride), your toddler can sit comfortably in a stable car and focus on pedaling. Each Dexton Kids Pedal Car is designed to give your children a safe and comfortable play experience. Their sturdy metal bodies will stand up to all the bumps that come from outdoor play. Padded seats will keep your kids comfy and happy for long afternoons “drives.” Steel wheels and rubber tires help keep each ride feeling smooth and safe. Some models have fun accessories like working headlights and working bells that both add to the car’s realism and increase its safety. While each Dexton Kids Pedal Car is top notch when it comes to quality, where they really shine is in appearance. Each of the ten different styles is unique and attractive, bringing to mind the styles of cars from years gone by. No matter what your child’s tastes or interests are, there’s a car that will suit them. Pretty in Pink: If you have a little princess in your life who loves all things pink, Dexton has several pedal cars that will be sure to delight her. Girls can choose from a classic 30’s design, a deluxe roadster, and even a 50’s style Dexton Kids Pink Comet Sedan. Cool Blues: If pink’s not your thing, you’ll also find some classic styles available in blue. Both the Voiture Classic Pedal Car and the deluxe roadster are available in a rich shade of blue. Imaginative Play: Many kids love pretending about the jobs they may have when they grow up. Pedal cars are a great way to encourage this imaginative play. Future mechanics will love coming to their friend’s aid with the Deluxe Tow Truck Pedal Car (it even has a working towing mechanism!). The Woody Wagon is a pint-sized delivery truck with a tailgate that opens up for additional storage. Saving the Day: Fire fighters and police officers are particularly attractive careers for young children. A Police Pick-up Pedal Car is available to help crime-fighters catch the bad guys. 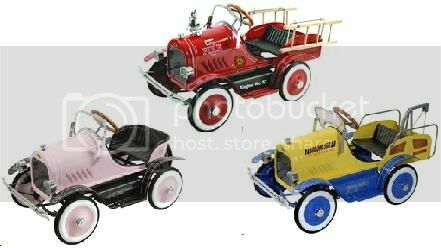 Any future fire man or woman is spoiled for choice with both a sleek comet firefighter car and the Dexton Kids Deluxe Fire Truck Pedal Car available to them. The jaw-dropping designs and high quality construction of all Dexton Kids Pedal Cars are sure to please both you and your kids. Get ready for hours of play this summer with these fun, attractive, and safe outdoor toys. Summer time is backyard time. 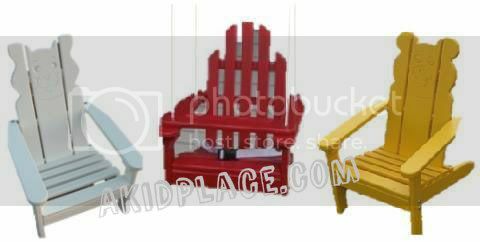 If your kids are raring to spend some time out in the sun, you might be looking into some furniture for your backyard. Prairie Leisure Kiddie Furniture is the perfect remedy to an empty patio. This furniture is made in the USA and is designed to fit the needs of all kinds of families. Children love furniture that’s sized just for them. It’s even better if furniture is made in a style that suits their playful spirits. Prairie Leisure Furniture keeps this playfulness in mind while still maintaining a standard of design that will fit in with even the most elegant of patios. The Kiddie Cat Chair is a perfect example of this. It is an Adirondack style chair that has the outline of a cat’s face on the top. It’s a fun and friendly place for kids to rest during family get-togethers or any other kind of backyard fun. There’s nothing worse than bringing a piece of furniture home and having it break within a week. Prairie Leisure Kiddie Furniture will not leave you with this problem. This furniture is proudly made in America, and it’s built to last. All Prairie Leisure products are designed to last from generation to generation. All you need to do is give it some minimal care (washing with soap and water and keeping it inside during the winter) and your chair will last long enough for your grandchildren to enjoy it as well. Let’s face it – not every boy and girl is going to want to just sit in a chair. If your child would rather move than sit still, the Prairie Leisure Kiddie Swing is sure to be a hit. This swing has the same attractive design as the other Kiddie chairs, but with a twist. It’s suspended by ropes, allowing your child to swing to her hearts content. A seat belt and safety tray will help your kids stay safe while still being able to swing. One of the nicest things about Prairie Leisure Kiddie Furniture is the customization options available when it comes to color. There are seven colors available for you to choose from, including Fire Engine Red, Sage, Hunter Green, Berry Blue, Buttercup Yellow, Black, and Satin White. You can even get the furniture unfinished if you like. Whether you’re choosing something fanciful like the Prairie Leisure Kiddie Bear Chair or a more conventional (but still kid-friendly) Adirondack, you can get exactly the color you’re looking for. The Prairie Leisure Kiddie collection is perfect for kids ages 1-4. You can also find the same quality and craftsmanship in their junior collection, which is designed for ages 5-8. With beautiful, high quality furniture like this, you and your family will be able to face summer head-on and enjoy all the good times your backyard has to offer. When you’re on the go it always helps to have a set of wheels to help you carry things. While you can always load up the car for a trip to the park or the store, you miss out on fresh air and exercise. If you and your kids are looking for a fun, yet practical and useful set of wheels, a Berlin Flyer Wagon is a choice that can’t go wrong. Berlin Flyer Wagons are made in the U.S.A. In fact, they’re all produced in the heart of Amish Country in Berlin, Ohio. When you buy one of these wagons, you know that you’re buying something that’s built to last. This isn’t a plastic big-box store special that will fall apart the moment you take it out of the box. Instead, it will last as long as your child needs it to. In fact, it will likely still be around when your kids have children of their own. So what makes these wagons so long-lasting? It’s all about their construction. These wagons are built with naturally finished hardwood that’s tough enough to stand up to the banging and bumping that comes with active play. Each wagon features NO-TIP ® safety steering, which is a registered trademark of Berlin Flyer. The lack of tipping both gives your boy or girl a safer play experience and helps eliminate unnecessary damage to the wagon. Depending on the model you choose, your wagon will have either solid rubber tires or inflatable pneumatic tires. Both types are rugged enough to deal with all sorts of terrains and speeds. You know that Berlin Flyer Wagons are tough, but are they useful? Absolutely! There are a few different sizes available, and each one is perfect for a certain use. For example, the Berlin Pee-Wee Flyer Wagon is perfectly sized for kids ages 3-8 to pull around. You can give your little ones a little more responsibility with this wagon, allowing them to pull their own belongings behind them when going on a walking trip. If you’re looking for something with a little more space, the popular Berlin Flyer Wagon gives you the same easy operation as the Pee-Wee but with a little more storage room. If you’re looking for some serious capacity, the Berlin Loadmaster Wagon is perfect for both heavy loads and rough terrains. A final thing to note about these wagons is their looks. Each wagon is carefully crafted and painted to look its best. The classic design brings to mind the style of Radio Flyer wagons, and depending on your preferences the siderails can be painted red or green. Both good looking and hard working – that’s tough to beat! American-made Berlin Flyer Wagons make for a hard-working yet attractive addition to any collection of outdoor toys. No matter what your children’s age or interests, they’ll love having a wagon of their own to help them transport their belongings. They’re a surefire way to build memories and have a ton of outdoor fun.